Search for all "CD31 / PECAM1"
Rat anti Mouse CD31 / PECAM1 ER-MP12. Product is tested for Frozen Sections, Flow Cytometry, Paraffin Sections. The antigen is a glutaraldehyde (0.05%) and paraformaldehye (1%) resistant 140 kD surface glycoprotein (reducing and non reducing conditions) identified as CD31. The antigen expression closely follows that of CD34. 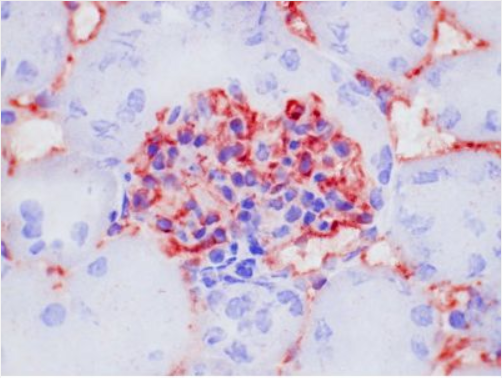 This antibody was produced serum-free, without fetal calf serum. 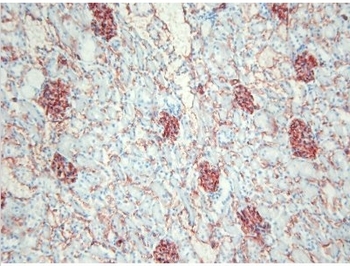 Immunohistochemistry on Frozen Sections: 0.25-0.5 µg/ml (1/400-1/800). Immunohistochemistry on Paraffin Sections: 20 µg/ml (1/10). Proteinase K pre-treatment for antigen retrieval is recommended. Do not use standard 4% Formalin fixation, but max. 0.05% glutaraldehyde or 1% paraformaldehyde! Suggested Positive Control: Mouse spleen. Has been described to work in FACS. CD31, also known as platelet endothelial cell adhesion molecule 1 (PECAM1), is a type I integral membrane glycoprotein and a member of the immunoglobulin superfamily of cell surface receptors. It is constitutively expressed on the surface of endothelial cells, and concentrated at the junction between them. It is also weakly expressed on many peripheral lymphoid cells and platelets. CD31 has been used to measure angiogenesis in association with tumor recurrence. Other studies have also indicated that CD31 and CD34 can be used as markers for myeloid progenitor cells and recognize different subsets of myeloid leukemia infiltrates (granular sarcomas). 4. Block with 10% normal goat serum in PBS for 30min. in a humid chamber. 5. Incubate with primary antibody (dilution see datasheet) for 1h in a humid chamber. 7. Incubate with secondary antibody (peroxidase-conjugated goat anti rat IgG (H+L) minimal-cross reaction to mouse) for 1h in a humid chamber. 9. Incubate with AEC substrate (3-amino-9-ethylcarbazol) for 12min. 11. Counterstain with Mayer's hemalum. 1. Deparaffinize and rehydrate tissue section. 2. Incubate the tissue section with proteinase K for 7min. 3. Wash in distilled water. 6. Block with 10% normal goat serum in PBS for 30min. in a humid chamber. 7. Incubate with primary antibody (dilution see datasheet) for 1h in a humid chamber. 9. Incubate with secondary antibody (peroxidase-conjugated goat anti rat IgG (H+L) minimal-cross reaction to mouse) for 1h in a humid chamber. 11. Incubate with AEC substrate (3-amino-9-ethylcarbazol) for 12min. 13. Counterstain with Mayer's hemalum. Li JL, Sainson RC, Shi W, Leek R, Harrington LS, Preusser M, et al. Delta-like 4 Notch ligand regulates tumor angiogenesis, improves tumor vascular function, and promotes tumor growth in vivo. Cancer Res. 2007 Dec 1;67(23):11244-53. PubMed PMID: 18056450. Bock F, Onderka J, Dietrich T, Bachmann B, Kruse FE, Paschke M, et al. Bevacizumab as a potent inhibitor of inflammatory corneal angiogenesis and lymphangiogenesis. Invest Ophthalmol Vis Sci. 2007 Jun;48(6):2545-52. PubMed PMID: 17525183. Beck H, Hellfritsch J, Kirsch J, Schneider M, Perisic T, Wortmann M, et al. Knockout of mitochondrial thioredoxin reductase stabilizes prolyl hydroxylase 2 and inhibits tumor growth and tumor-derived angiogenesis. Antioxid Redox Signal. 2015 Feb 3. PubMed PMID: 25647640. Larghero P, Venè R, Minghelli S, Travaini G, Morini M, Ferrari N, et al. Biological assays and genomic analysis reveal lipoic acid modulation of endothelial cell behavior and gene expression. Carcinogenesis. 2007 May;28(5):1008-20. Epub 2006 Nov 24. PubMed PMID: 17127716. Leenen PJ, Melis M, Slieker WA, Van Ewijk W. Murine macrophage precursor characterization. II. Monoclonal antibodies against macrophage precursor antigens. Eur J Immunol. 1990 Jan;20(1):27-34. PubMed PMID: 2407538.
de Bruijn MF, Slieker WA, van der Loo JC, Voerman JS, van Ewijk W, Leenen PJ. Distinct mouse bone marrow macrophage precursors identified by differential expression of ER-MP12 and ER-MP20 antigens. Eur J Immunol. 1994 Oct;24(10):2279-84. PubMed PMID: 7925556. Ling V, Luxenberg D, Wang J, Nickbarg E, Leenen PJ, Neben S, et al. Structural identification of the hematopoietic progenitor antigen ER-MP12 as the vascular endothelial adhesion molecule PECAM-1 (CD31). Eur J Immunol. 1997 Feb;27(2):509-14. PubMed PMID: 9045924. De Bruijn, M.F.T.R. et, al. Analysis of ER-MP12/20 bone marrow populations in Listeria monocytogenes infected mice: a flow cytometric alternative for differential counting. J. Immunol. Meth. In press. Takahashi K, Umeda S, Shultz LD, Hayashi S, Nishikawa S. Effects of macrophage colony-stimulating factor (M-CSF) on the development, differentiation, and maturation of marginal metallophilic macrophages and marginal zone macrophages in the spleen of osteopetrosis (op) mutant mice lacking functional M-CSF activity. J Leukoc Biol. 1994 May;55(5):581-8. PubMed PMID: 8182336. Restore by adding 0.5 ml distilled water (= 0.2 mg/ml Stock Solution). Monoclonal CD31 antibody (clone ER-MP12) recognizes PECAM-1, platelet/endothelial cell adhesion molecule 1. It is a general marker for the detection of a major population of haematopoietic stem cells and is useful for the accumulation of early murine macrophage precursors from bone marrow cell suspensions by FACS. An even more precise characterization of such isolated and concentrated precursor cells is achieved when ER-MP12 is combined with other markers like ER-MP20 (anti Ly-6C, Cat.-No BM4019) or ER-MP58 (Cat.-No BM4089). 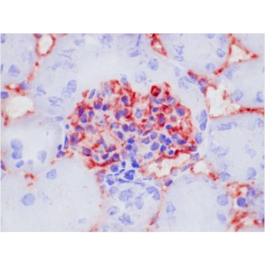 The ER-MP12 antigen is also expressed by endothelial cells. Isolated Cells: The antigen is found on the surface of approximately 40% of freshly isolated bone marrow cells of adult mice, on the majority of immortalized macrophage precursor cell lines (M1, RMB-1, RMB-3) corresponding to CFU-GM cells. The antibody detects pluri- and multipotent stem cells and prothymocytes as well as particular lymphoid cells in bone marrow and peripheral lymphoid organs. Tissue Sections: The antigen is detected within the lymphopoietic islands in the spleen of newborn (day 12) and in the bone marrow of adult mice. Capillary endothelial cells of adult mice also express the antigen. Detects a major population of Mouse colony forming unit macrophage (CFU-M) precursor cells, subpopulation of pre CFU-M and monoblasts, precursor cells of granulocytes.